Hyde is a spectacular 10,000-square-foot indoor-outdoor nightlife venue, created by sbe Founder and CEO Sam Nazarian in partnership with global design icon Phillippe Starck. 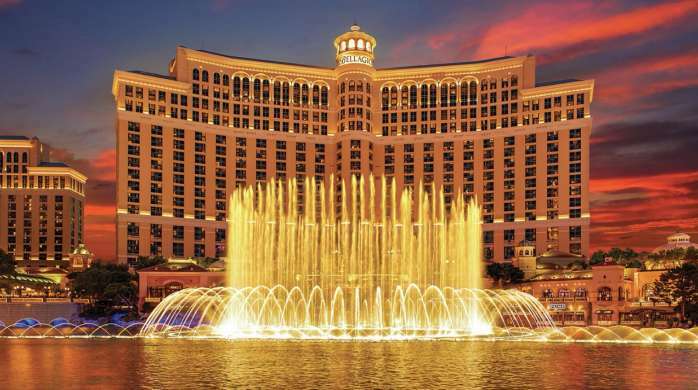 It starts with the most coveted location in Las Vegas, overlooking the Fountains of Bellagio. The space itself is built on mystery and is said to have been the opulent Italian villa of a famed Renaissance artist, who tailored seductive grand festival masks. With an eclectic and refined taste, the artist fashioned his surroundings with worldly treasures, complemented by Italian marbles, reclaimed woods, lavish chandeliers, and towering glass doors that led to a secluded Tuscan garden. This is the villa that has been artfully brought back to life by visionary design icon Philippe Starck as Hyde Bellagio. A night at Hyde begins with an exclusive early-evening experience beginning at 5:00 PM highlighted by an award-winning mixology program and a menu of intriguing small plates from Lago. Long after the sun sets, Hyde Bellagio evolves into Vegas' hottest nightlife destination, with 40 VIP tables, a diverse rotation of DJs and live performances. Select bottles & glasses of wine are half-off on Wednesdays. Wine selections rotate each month, so you are sure to find a new favorite, or stick to a tried-and-true classic. From 5:00 P.M. - 10:00 P.M.
Join HYDE for a seamless indoor-outdoor Nightclub experience with floor-to-ceiling windows. With an expansive terrace overlooking the stunning Fountains of Bellagio, you’re able to watch the Fountains every 30 minutes starting at 5 p.m.
Every Wednesday guests will enjoy a variety of half-priced bottles and glasses of wine during UnWined Wednesdays from 5 p.m. – 10 p.m. With different regions featured each month, guests can relax with spectacular views of the famed Fountains of Bellagio as they sip an array of celebrated wines from across the globe. Traditional Italian small plates from Lago by Julian Serrano create perfect pairings and are available to order until 10 p.m.
Every Thursday guests are invited to kick the night off at Hyde Bellagio with The Rewind from 8 p.m. – midnight. Featuring the hottest throwback beats by some of the most talented DJs, partygoers can dance the night away and enjoy cutting-edge libations and creative Italian small plates from Lago by Julian Serrano. Hyde Nightclub offers a different experience every night. Every Tuesday, Hyde Bellagio invites insiders and influencers from Las Vegas and around the world to experience INdustry Tuesdays. The night features live performances and a diverse rotation of DJs Locals receive complimentary admission until midnight with valid ID. Every Wednesday, Hyde Bellagio celebrates She Loves Wednesdays, where ladies receive complimentary admission until midnight for unparalleled night filled with tasty libations and sizzling sounds by some of the most talented DJs. Every Friday beginning at 10:30 p.m., Hyde Bellagio invites influencers to experience Friday Night Social, featuring a diverse rotation of DJs, live performances and tasty libations from Hyde’s award-winning mixology program. Every Saturday, Hyde Bellagio invites socialites and trendsetters to dance the night away with sounds by some on the most talented DJs spinning Top 40 hits until the early hours of the morning. Every Sunday, the fountain-side hotspot will come to life during Stereo Hyde to provide an unforgettable VIP experience with tasty libations and high-powered sounds by some of the most talented DJs. Stereo Hyde is the newest addition to Hyde’s weekend lineup where guests can dance to the hottest tracks until the early morning hours during this weekly party. All packages are available on Tuesday, Wednesday, Friday, Saturday, and Sunday nights beginning at 10:30 PM. All packages are subject to availability and can change without notice. Enjoy a Seasonal Signature cocktail while overlooking the stunning fountains of Bellagio. Follow the main walkway towards the Casino. Once you have entered the Casino keep left. You will pass Yellowtail, Le Cirque, and LAGO. Hyde will be on your left-hand side. Enter the Casino and take the right-hand walkway near Hermes. Continue on the walkway passing Jasmine on your right, Hyde will be on your right-hand side. Petrossian has been named one of America's best hotel bars by the hospitality industry's Santé Magazine, thanks to our team of seasoned mixologists. There is so much to experience at Petrossian Bar: the house made infused cocktails, the vodka sampler, smoked salmon and caviar or afternoon tea. An epicurean's delight, Petrossian Bar is the ultimate respite for enjoying the finer things in life. This elegant lounge is a refreshing alternative to the high energy of Las Vegas nightclubs. Enjoy a unique seasonal cocktail menu and inspired music mixed by top DJs.